A recent panel discussion provided some behind-the-scenes looks at what went into making Rogue One. 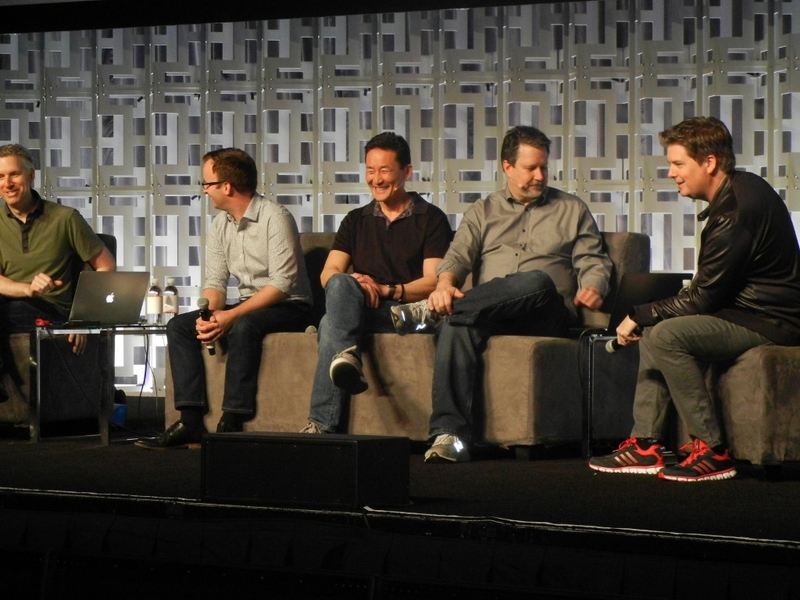 Moderated by David W. Collins, “The Making of Rogue One” took place at Star Wars Celebration Orlando and featured John Swartz, co-producer of Rogue One, John Knoll, executive producer and visual effects supervisor of Rogue One, Doug Chiang, co-production designer of Rogue One, and Matthew Wood, Supervising sound editor of Rogue One. There was, obviously, a lot that went into making the movie. It was clear that the panelists had come to the panel well-prepared, with plenty of visuals, as well as videos, packaged very neatly together. It certainly showed that they had spent considerable time collating these varying materials and had collaborated very well to put together such a presentation. Clearly, this team that put together such a well-thought out movie such as Rogue One could pull off a great collaboration for this panel presentation scheduled for an hour to a live audience at Star Wars Celebration Orlando. There was one snag, however, that was out of their hands: ReedPop, who organized the event did not begin allowing people into the audience until after the presentation was scheduled to begin. This resulted in the panel discussion starting a half-hour behind schedule, not only cutting short the amount of time that the presenters had, making them speed up, as well as skipping entire sections, entirely, but also excising any possibility of a Q&A session. This was very unfortunate not only for the audience, but also put undue pressure on the panelists, who had clearly spent significant time preparing for the presentation. Knoll started off by discussing and showing virtual sets of the Death Star that did not make it into the movie, which had Collins exclaiming, “this is like fulfilling the childhood dream of walking the Death Star!” These virtual sets were very neat and they showed a bunch of scenes, although video recording was strictly forbidden. They also built very basic sets for the Tantive IV and the Profundity, then used virtual reality for the rest of the scenes that involved those decks. They also used some virtual reality with the Iceland set (on Lah’mu), although it was “more than what we wanted to do”, said Knoll. They actually brought some props in a truck. According to Swartz, “at least 30% of the frame that is real”, referring to Galen Erso’s emergence from the homestead to greet Orson Krennic. They also discussed how, although they used blue screens to take the place of screens outside of certain ships, they were able to show on the Death Star a screen of Jedha, which made it easier for the actors. Since this was in-camera, it also affected the lighting of the set (as opposed to a blue screen lighting). Another occurrence of an in-camera background was with the Coruscant apartment screen. For the scene beyond the windows, they actually used a matte painting from Revenge of the Sith, since that was also for Coruscant. However, it may not be instantly recognizable, since it was “out of focus that you don’t see it,” which turned out to be nicer, said Knoll. The discussion then turned to virtual production, which was led by Chiang. He pointed out that they could do both “2D and 3D at the same time.” Since it was a virtual system, “we could load it up and walk through it.” What made this particularly great is they normally have to wait a few months to go ahead with a set. However, with this technology, “within hours or a day of Gareth’s approval, we could load it up as proof of concept” and that “he could actually walk in it in real-time.” And, added Chiang, Edwards really got how it could be used: “Gareth started using it as an interactive design tool and could move things.” Since one can get better information sooner about the sets, “it’s a “really great way of advancing the design technology”, said Chiang. Chiang then discussed Vader’s castle on Mustafar, including that they had to figure out why Vader would come back to Mustafar. They decided that he would come back to recover in the bacta tank, so “we designed the whole structure around the bacta tank,” said Chiang, and Edwards approved it. Initially, they had created a larger room, but they had to make a 20-30% reduction from what they had originally done, since “Gareth thought it was too big” of a room. The next topic to discuss was Tarkin, which the crowd was excited to see. The casting, according to Swartz, was “a hard process to start”, but “Guy Henry immediately stuck out,” as his movements and the way he talked were so similar to how Tarkin moved in A New Hope. What was shocking was that Henry wasn’t even that familiar with Peter Cushing. Once he was hired, Henry then watched a lot of the original Tarkin stuff and he got it down. They then showed Henry on-set as Tarkin speaking with a camera apparatus on his face and what he was doing. Before going straight to a CGI of Cushing’s likeness, Knoll said, “we made a CGI version of Guy as an intermediate version.” They then showed various stages of Tarkin from Henry to Cushing, which was very involved and intricate, which made it all the more impressive having Tarkin look so much like Cushing. 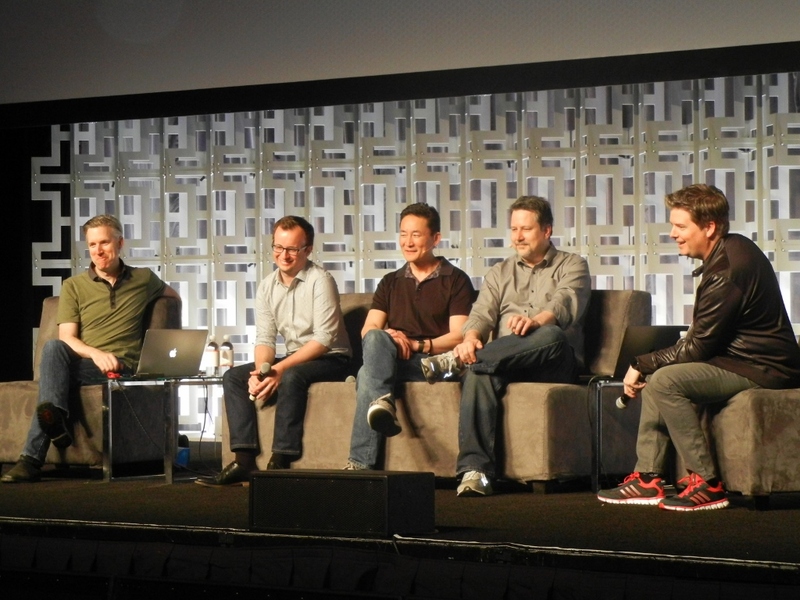 Since K-2SO moved according to how Alan Tudyk moved, “He had a day to get used to the movements and how he wanted K-2SO to behave,” said Knoll. Knoll also pointed out that, while Tudyk mostly wore stilts to portray K-2SO, he sometimes didn’t wear them, and wore simply a “head backpack”, such as Tudyk’s first day, which was on Jedha, since they were on rocks. 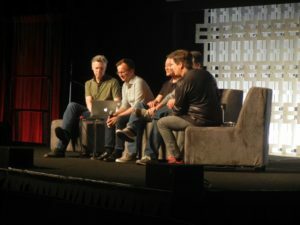 Knoll shared with the audience that, on Jedha, when K-2SO slaps Cassian Andor, it was actually “not scripted.” Since it wasn’t, Knoll said, “look at Diego’s face, because he was covering it, because he was laughing” out of humored surprise. 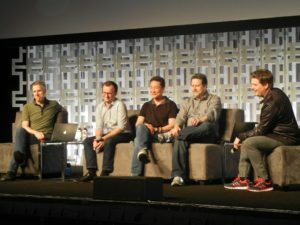 At this point in the presentation, the pressure of time became evident, as they hurried up what they had wanted to discuss about K-2SO, totally skipped a segment on environments, and barely touched on the next topic. The next topic was the Kitbash Library, which were model toy kits that they had to scour eBay for 70s era kits. They then took those plastic model kits and emulated them for the computer, which they then used to create virtual ships. Before being ushered out of the room, they did get to show us gags and errors, such as with Raddus and his assistant, as well as another with Vader. They showed us some Tarkin CGI that went horrifically not the way it was supposed to. “When you’re doing something technically difficult, it sometimes goes wrong,” observed Knoll. At the communication tower on Scarif, they showed Jyn playing a game of pong on the screen. A very cute gag was showing K-2SO playing with a storm trooper doll and a deathtrooper doll in a cockpit with the same dialogue that Tudyk’s character (Hoban “Wash” Washburne”) uses in Firefly with dinosaurs. 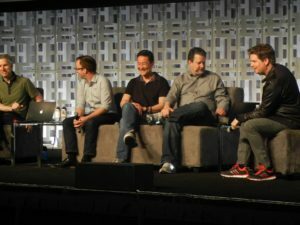 The panel discussion allowed for audience members to get a taste of the great work that went into the making of Rogue One with the very creators, themselves. Moreover, it was clear that the panelists had put a good deal of work into the presentation, itself. The panel, which was supposed to have begun at 1:30pm that day, did not even have an audience at that time, due to ReedPop’s decision-making. Rather, they only let attendees in after 1:30pm and didn’t get started in earnest until around 2pm. It was such a shame that ReedPop did not let attendees in earlier and that time was taken away from both the audience and the panelists. The panel went until a little after 2:40pm, but was nevertheless, an abbreviated experience.